Guam, 1899, 1¢-2¢, 4¢-10¢ Issue, each cancelled by purple "Agana, Guam" straightline, matching "Feb 6 - 1901" postmark and "Agana, Guam," circular registry handstamp with manuscript "R.359" number on green cover to Germany, reverse with partial Military Station Registered transit cds and Oldenburg (3.27) arrival cds; light central crease, otherwise Very Fine and scarce group on cover. Scott No. 1, 2, 3-8 Estimate $300 - 400. 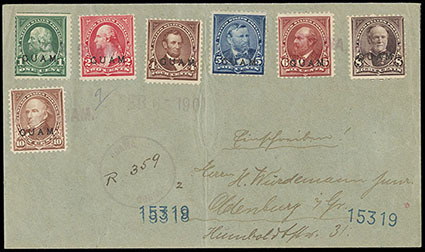 Guam, 1899, 5¢ blue, in combination with 1899, 1¢ deep green + 2¢ rose carmine, 2¢ with natural s.e. 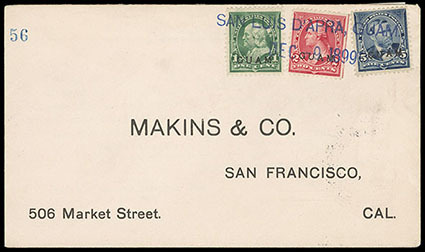 at right, all tied by complete strike of blue "San Luis D'Apria, Dec 9, 1899" straight line postmark on cover to San Francisco, Cal., Manila transit and receiving backstamp, Very Fine and choice, an excellent strike of this scarce postmark; with 2014 P.F. certificate. Scott No. 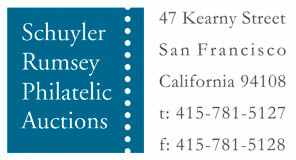 5+1+2a Estimate $200 - 300. Guam, 1899, 10¢ brown, type I, tied by perfect bold "Guam, Isl. 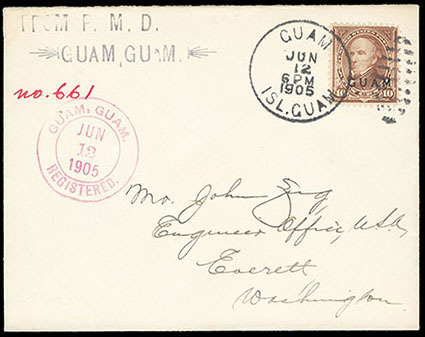 Guam, Jun 12, 1905" duplex on Zug cover to Everett Wash., pink "Guam, Guam, Registered. Jun 12, 1905" cds, Extremely Fine.